Entropia Universe's real money transaction system allows players to buy anything with actual, real-world cash -Â up to and including the game's virtual celestial bodies. Don't feel bad if you haven't heard of Entropia Universe. The MMO has been around for years, but it's never really achieved any notable success beyond the novelty of being a game built around players trading real-world money for virtual goods. There's in-game lore and probably inter-personal drama, but the only thing you really need to know about Entropia Universe is that it's built to part players from their money. Case in point: A player using the handle "Modified Akoz Power" recently gathered a small group of investors together to buy the moon. That's no typo, these would-be virtual land barons ended up shelling out $150,000 USD for ownership of the in-game planetoid. This is nothing terribly new for Entropia Universe, a game in which a faux space station sold for $330,000 USD in 2009, but what sets this deal apart from the headline-grabbing transactions of the past is that the moon's new owners have entered into a profit-sharing agreement with Entropia Universe developer MindArk. Specific contract details are not public, but under the terms of the agreement MindArk will fork over a percentage of all real-money revenue generated by the property recently purchased by Modified Akoz Power. Given the size of the moon and how frequently players are willing to invest huge amounts of cash into Entropia Universe, that staggering $150,000 price tag might not be such a bad deal once profit starts rolling in. What drives a person to spend this kind of money in an online videogame? 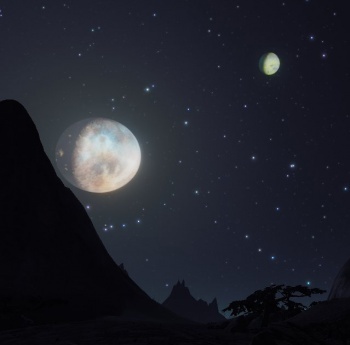 According to Modified Akoz Power, ownership of the moon is just one more aspect of Entropia Universe's entertainment value - it's sort of a large-scale, hyper-capitalist SimCity. "What interests me the most about the moon investment is that unlike land areas the moon owner can truly be a part of shaping this rock into something of his own, rather than buying a static premade area." "The moon's success will depend on what the owner can make out of it." Can we fault a person for wanting to own a large chunk of virtual land? Not at all. Who doesn't enjoy molding a virtual landscape to their own personal preferences? For that matter, I won't even slam Modified Akoz Power for dropping enough cash on the faux moon to buy a home in our meatspace reality. If you can afford a hit like that and aren't hurting anybody in the process, it's entirely up to you what you want to spend your cash on. Would it have been preferable for that money to go to charity? Sure, but it's not our place to judge morality. We report on videogame news, and in that light Modified Akoz Power did us a huge favor. Propers for that, if nothing else.